Arab Women Face Barriers in Politics…. The results of the recent elections in Morocco brought the debate on female political representation back into the political arena there. Only 34 women won seats in the legislature’s lower chamber, compared to 35 in the previous elections, a mere 5 percent of all representatives. In Turkey, women won 50 out of 550 seats in the Turkish Parliament. Although this is still only 9 percent of the total, it is an encouraging sign since the number of elected women more than doubled from the last parliamentary elections. This percentage of female representation is the second largest in the region after Iraq, where there are 70 women in the 275-member Iraqi Parliament. Women are also often seen as less experienced in public affairs, and as a result, voters – both male and female – are less likely to vote for them. Consequently, women either refrain from running for political office or drop out early from a lack of local support. This usually helps explain why only a small number of female candidates run for public office. For example, of the 800 candidates in the October 27 Omani elections, only 25 were women. In addition, there are other factors that serve as obstacles for women to run for political office. These include varying and often unsatisfactory levels of democracy, freedom of expression, pluralism, respect for diversity and open dialogue. There has been quite a lot of controversy recently about muslim women and their ability to exercise their democratic right to vote, while still following their religious or cultural tradition or wearing a burka and covering their face. Luckily, women will now be able to vote and observe their religious beliefs. This is obviously a good thing, because even if you disagree with the practice of wearing a burka, the last thing that will ’empower’ these women is denying them their democratic rights! 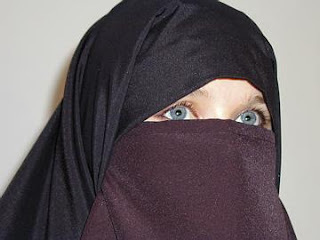 Ottawa — Muslim women wearing niqabs or burkas covering their faces won’t have to remove them to vote in three federal by-elections in Quebec on Sept. 17. Elections Canada spokesman John Enright says the women can bring a piece of identification with a photo or another document proving their identity when they vote. However, the women wearing niqabs or burkas who don’t have any documents would have to show their faces to allow their identity to be confirmed. Fredrik Dahl writes a great article about Nobel Peace Prize laureate Shirin Ebadi and her recent call for the UN to investigate the status of women in Iran. I recently read Ebadi’s autobiography called Iran Awakening: A Memoir of Revolution and Hope and was moved by Ebadi’s story and her struggle for women’s rights in Iran. A former judge, she was pushed out of the courts when the Iran’s religious revolution took place. TEHRAN – Nobel Peace Prize laureate Shirin Ebadi said she had asked the United Nations to investigate the status of women in Iran and accused Iranian authorities of detaining activists demanding more women’s rights. Ebadi, speaking at a press conference on Monday marking the first anniversary of a campaign to gather 1 million signatures in favour of women’s rights in the Islamic state, said she had contacted top U.N. human rights official Louise Arbour. She said about 50 activists had been detained over the last 14 months for involvement in women’s rights protests and some of them faced charges of acting against national security. She did not say how many – if any – were still being held. Western diplomats and rights groups say Iran is taking a tougher line against dissent in general, possibly in response to increased international pressure over its disputed nuclear activities, which the West suspects is aimed at making bombs. The Islamic Republic rejects allegations it discriminates against women, saying it follows sharia law. Tehran usually reacts dismissively toward criticism from any foreign organisations, including the United Nations. ‘I have written a letter to the U.N. High Commissioner for Human Rights and complained for the first time, and said this is the situation of women rights in Iran and these are our demands,’ Ebadi said. ‘Please send a special rapporteur to Iran to report on women, to investigate the conditions for women,’ she said, describing her message to Arbour. 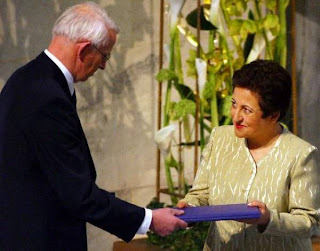 Ebadi won the Nobel Peace Prize in 2003 for her work on women’s and children’s rights. Campaigners say Iranian women face difficulties in getting a divorce. They also criticise inheritance laws they say are unjust and the fact that a woman’s court testimony is worth half that of a man’s. Activists say scores of people were detained at protests for greater women rights in Tehran in June 2006 and in March this year, which authorities had declared illegal. In April, an Iranian news agency said four campaigners were detained while collecting signatures for the petition demanding equal legal rights with men. ‘Unfortunately, about 50 people involved in gatherings demanding equality … had cases (against them) and were in prison for a while and some of them are waiting for their verdicts now,’ Ebadi said. U.S.-based Human Rights Watch earlier this year said six women were convicted after taking part in last year’s protest. Women’s rights campaigners vowed to press on with the signature campaign, but did not say how many they had collected since it was launched in August last year. Although women are legally entitled to hold most jobs in Iran, it remains a male-dominated society. Women cannot run for president or become judges but in recent years they have started to work in police and fire departments. Ebadi is a fabulous woman and is such a remarkable campaigner for women’s rights! I recommend her book to anyone interested in better understanding Iran or women’s rights there. Megan Stack from the LA Times has an interesting article about being a foreign correspondent in Saudi Arabia. 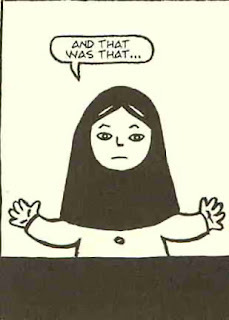 It’s an interesting take on her experiences there as a woman and about being a Western woman grappling with cultural differences. Riyadh, Saudi Arabia — THE hem of my heavy Islamic cloak trailed over floors that glistened like ice. I walked faster, my eyes fixed on a familiar, green icon. I hadn’t seen a Starbucks in months, but there it was, tucked into a corner of a fancy shopping mall in the Saudi capital. After all those bitter little cups of sludgy Arabic coffee, here at last was an improbable snippet of home — caffeinated, comforting, American.I wandered into the shop, filling my lungs with the rich wafts of coffee. The man behind the counter gave me a bemused look; his eyes flickered. I asked for a latte. He shrugged, the milk steamer whined, and he handed over the brimming paper cup. I turned my back on his uneasy face. “Excuse me,” hissed the voice in my ear. “You can’t sit here.” The man from the counter had appeared at my elbow. He was glaring.”Excuse me?” I blinked a few times. He didn’t tell me what I would learn later: Starbucks had another, unmarked door around back that led to a smaller espresso bar, and a handful of tables smothered by curtains. That was the “family” section. As a woman, that’s where I belonged. I had no right to mix with male customers or sit in plain view of passing shoppers. Like the segregated South of a bygone United States, today’s Saudi Arabia shunts half the population into separate, inferior and usually invisible spaces. What I like about Stack’s article is how it tells a complex story about many women wanting very different things. Check it out! It gives you something to think about. One afternoon, a candidate invited me to meet his daughter. She spoke fluent English and was not much younger than me. I cannot remember whether she was wearing hijab, the Islamic head scarf, inside her home, but I have a memory of pink. I asked her about the elections. “Very good,” she said. So you really think so, I said gently, even though you can’t vote? “Of course,” she said. “Why do I need to vote?” Her father chimed in. He urged her, speaking English for my benefit, to speak candidly. But she insisted: What good was voting? She looked at me as if she felt sorry for me, a woman cast adrift on the rough seas of the world, no male protector in sight. Through the years I have met many Saudi women. Some are rebels; some are proudly defensive of Saudi ways, convinced that any discussion of women’s rights is a disguised attack on Islam from a hostile Westerner. There was the young dental student who came home from the university and sat up half the night, writing a groundbreaking novel exploring the internal lives and romances of young Saudi women. The oil expert who scolded me for asking about female drivers, pointing out the pitfalls of divorce and custody laws and snapping: “Driving is the least of our problems.” I have met women who work as doctors and business consultants. Many of them seem content. Whatever their thoughts on the matter, they have been assigned a central, symbolic role in what seems to be one of the greatest existential questions in contemporary Saudi Arabia: Can the country opt to develop in some ways and stay frozen in others? Can the kingdom evolve economically and technologically in a global society without relinquishing its particular culture of extreme religious piety and ancient tribal code? The men are stuck, too. Over coffee one afternoon, an economist told me wistfully of the days when he and his wife had studied overseas, how she’d hopped behind the wheel and did her own thing. She’s an independent, outspoken woman, he said. Coming back home to Riyadh had depressed both of them. “Here, I got another dependent: my wife,” he said. He found himself driving her around, chaperoning her as if she were a child. “When they see a woman walking alone here, it’s like a wolf watching a sheep. ‘Let me take what’s unattended.’ ” He told me that both he and his wife hoped, desperately, that social and political reform would finally dawn in the kingdom. He thought foreign academics were too easy on Saudi Arabia, that they urged only minor changes instead of all-out democracy because they secretly regarded Saudis as “savages” incapable of handling too much freedom. “I call them propaganda papers,” he said of the foreign analysis. “They come up with all these lame excuses.” He and his wife had already lost hope for themselves, he said. The Globe and Mail reports on the recent Saudi Arabia incident in which women who were representing Canada and a post-secondary institution at an education fair were ushered out by ‘Virtue’ police. George Chrysomilides, president of the Canadian Education Network, said there hasn’t been an incident like this in the 10 years Canada has attended the event, and he plans to get to the bottom of it. “From what I hear … the religious police were very rude. They shouted at them in a way that was disrespectful and they shut down the booth, the Canadian embassy booth as well as the LaSalle College booth,” Mr. Chrysomilides said in an interview Monday. Foreign Affairs spokesman Bernard Nguyen said he was waiting to hear details of the incident that took place last Wednesday. But the Canadian embassy in Saudi Arabia put out a statement over the weekend, protesting against the actions of authorities in the region. “Such unprofessional incidents are very damaging to Saudi Arabia’s international reputation,” the embassy said. Women in Saudi Arabia are expected to cover themselves in public and are not allowed to work in mixed environments in the ultra-conservative kingdom. I think this is obviously inappropriate. By throwing women out for working in the fair, what kind of message does that send to young women attending the fair? Thoughts?